Born in Port of Spain, Trinidad on August 27, 1959, Jennifer Carroll is the 18th Lieutenant Governor of Florida. Carroll is the first African-American woman elected to the position, she took up office on January 4, 2011. Carroll served for over seven years as a state legislator before becoming Lieutenant Governor. Jennifer Carroll emigrated to the United States in 1967 settling in Uniondale, New York. She began working at the age of 15, in a nursing home as a hospital volunteer in Uniondale and worked as a cashier in a local grocery store and also as an ordering clerk at AFM Bowling corporate headquarters in Long Island, New York. After attending modelling school in Albuquerque, New Mexico, Carroll was contracted for photo shoots, commercials, and movie extra parts. In 1985, Carroll received a Bachelor of Arts degree in political science from the University of New Mexico. She moved to Florida the following year and received a Master of Business Administration online degree from Kensington University in 1995. She graduated from St. Leo University with an online MBA degree in 2008 which she put to use when she and her husband, Nolan, began a public relations consulting and franchising business. In 1979, Carroll enlisted in the United States Navy, starting as a jet mechanic and retired in 1999 as a Lieutenant Commander Aviation Maintenance Officer after 20 years in the service. 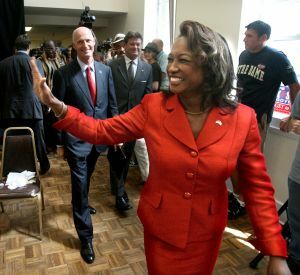 In 2003, Carroll ran for the Florida House of Representatives and became the first African-American female Republican elected in Florida’s history. She represented the 13th District in the Florida House of Representatives after winning a special election in 2003 and continued to represent the district until 2010. While serving in the Florida legislature, Carroll sponsored legislation that supported economic development in the state. Her most significant bill allowed the state to obtain $2.9 million in federal funds to pay for the Florida Export Finance Corporation, which helps employers have access to short term loans and create jobs. Carroll also sponsored the Entertainment Economic Development Act, which spurred activity in the movie industry. Carroll served as Deputy Majority Leader (2002-2004), Vice Chair of the Transportation and Economic Development Committee (2003-2004), Majority Whip (2004-2006) and Chair of the Economic and Development Council (2008-2010). She has been on the Florida Chamber of Commerce Honor Roll every year since 2004 and has won the Faith and Family Award from the Christian Coalition of Florida in 2005 and 2008. In 2009, she won the Florida Veterans Service Officers Association Legislator of the year award and the following she was the Florida Retail Federation Legislator. Carroll made two unsuccessful bids for a U.S. House of Representatives seat in 2000 and 2002. Following her defeat in 2000, she was appointed Director of the Florida Department of Veterans Affairs and served in the post until July 2002. On September 2, 2010 after winning the Republican primary for governor, Rick Scott named Carroll his running mate in the 2010 Florida gubernatorial election. Carroll is married to Nolan Carroll, Sr. of Miami. The couple have three children, Nyckie, Necho, and Nolan II (who is a professional football player with the Miami Dolphins). The Carrolls ran a successful public relations consulting and franchising business, 3N & JC, in Florida. However, this firm, 3N & JC, did consulting work for a registered charity organization, Allied Veterans of the World. In a Law Enforcement crackdown on gambling and Internet café gambling centers in 2012 and 2013, Allied Veterans of the World was found guilty of illegal gambling, racketeering, and money laundering. Law enforcement also found that it gave only two percent of its profits over three years to charitable causes, while dedicating large sums of money to gambling lobbying efforts and donations to political campaigns. Not only did Carroll write Allied Veterans in as a source of income for 3N & JC, she filed legislation that would have formally legalized the gambling and gaming industry, which falls into a gray area in Florida state law. In March 2013, after being questioned for her role in the Allied Veterans scandal, she resigned from her position as Lietenant Governor. Aaron Deslatte. “Rick Scott Chooses Jennifer Carroll as Running Mate”. Orlando Sentinel. Internet. 12 Dec 2011. http://articles.orlandosentinel.com/2010-09-03/news/os-scott-names-jennifer-carroll-20100902_1_lieutenant-governor-democratic-nominee-alex-sink-jennifer-carroll; Matt Dixon, "Lt. Gov. Jennifer Carroll Resigns After Being Questioned About Allied Veterans," 13 March 2013. http://jacksonville.com/news/2013-03-13/story/lt-gov-jennifer-carroll-resigns-after-being-questioned-about-allied-veterans.